Greg @Zarrdogg White makes it 125,000 on the 6-9-J, Two-Hearts flop and @ChrisElkins makes it 275,000. White calls and to the turn they go. Eight_of_Hearts and White adds 200,000 more. Elkins doesn't like the bet-sizing at all and takes nearly two minutes before moving all-in ... and White snap-calls. "I did not want a call there," says Elkins as he turns over Pocket_Sevens with the 7 of hearts for a gutter to a straight flush. 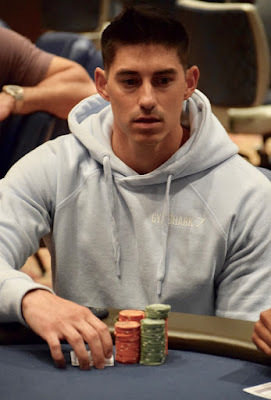 535,000 for Elkins, 575,000 for White .. Elkins is eliminated in 9th place, the second final table elimination for White who earlier sent Rob Anderson home in 10th.